Ekso Bionics Holdings, Inc. EKSO - On a choppy day for the markets as a whole, we managed to root out a decent intraday mover in EKSO. This stock traded in a daily range from a low of 1.40 and ran as high as 1.92. That works out to 37% pop, and it occurred on roughly 12.5X the 30-day average volume. With a strong close at 1.81, we’ll be interested in continuing to track EKSO as we head into week’s end, keeping an eye out for the registering of higher highs and higher lows. LiNiu Technology Group, Inc. LINU - Also contained in yesterday’s premarket report was a reference to LINU, and it too made a moderate move on the day. From its low of .42 LINU managed to get up as high as .5569, which marked a 33% upswing and that came on just a hair under five times the monthly average volume, so we’ll continue to keep tabs on this play as well. 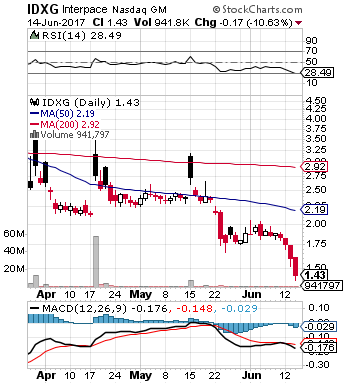 As you can see on the chart below, IDXG has taken a bit of a beating of late, and we noticed it gapping up significantly in the premarket this morning, so we want to signal it for observation. The early activity could be due in part to a bullish IDXG blurb published on Seeking Alpha this morning, but as we mentioned above, this in an interesting play purely from a technical perspective as well. We’re always looking for bottom bouncers to track and IDXG currently fits that bill. . 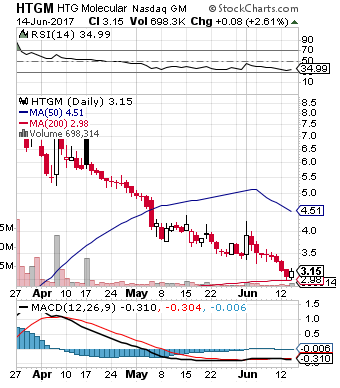 Speaking of bottom bouncers showing life in the premarket, we also want to point out similar activity in HTGM. Like the above-mentioned play, the stock has recently experienced an extended selloff period, and could be ready to mount a comeback, so we’ll be on the lookout for that. .